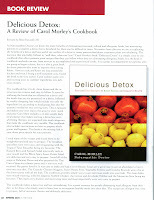 Another Delicious Detox Review By Colleague! This afternoon I truly became my mother in the kitchen! No recipes, random ingredients, no mixing, soup on the stove, beets in the oven, hummus in food processor on counter ..... I guess that is what cool fall days are for! I had leftover pumpkin puree from a loaf I made last week and it was starting to annoy me everytime I opened the fridge. You know those ingredients that you buy for one dish but have no clue what to do with the rest of it?!?! A little olive oil, chopped onion, 2 celery ribs, 2 carrots, 1 parsnip and threw in some red chili flakes, and garlic. Then the pumpkin and applesauce went in with a bay leaf. I remembered I still had some chicken stock in the freezer so defrosted it and put it in and let it simmer for an hour. I had some strange looking oregano in the fridge that was on the verge of garbage so I put that in with some sea salt and pepper and ended up pureeing half of it.... So we'll have this tonight with a roast chicken that's in the oven and some leftover green beans. Random but healthy and delish! Friday night Chris and I were going to friends for dinner so I decided to bake a couple of goodies for the crew. We got to dessert and I said a disclaimer that the treats were all gluten-free and I was using all 7 of them as guinea pigs. I love playing this game .... especially with non-gluten-free friends aka Chris' friends! Here's the recipe if you feel like something chocolately without gluten. If you don't do a lot of baking you can go to a bulk store and just get enough to keep the cost down. Preheat oven to 325. Mix dry ingredients in one bowl and wet in another and then combine until smooth. Scoop batter into greased (use a bit of coconut oil) muffin tins. Bake for 5 minutes then rotate and bake another 5 minutes. Let them sit for 10 minutes and then eat away! Ahhhhhhhh. One more patient this evening and I'm going to scoot into our infrared sauna. I hadn't been in the sauna for quite a few months because most evenings at 6:30 I just want to get home to make dinner and spend some time with my husband. So last week with some free evenings and not having to rush out of here, I decided to re-aquaint myself with my soothing and relaxing infrared sauna. For those not familiar with an infrared sauna it is a dry sauna that uses the infrared wavelength to heat the body from inside out. A conventional sauna just heats the air around you and you can only really sit in it for 15 minutes. The heat penetrates deeply so it hits the tiny blood vessels in the joints and muscles, and the fat cells where toxins may be stored. This is why people with arthritis, or fibromyalgia find it helpful in increasing range of motion and decreasing pain. It's also wonderful for weight loss because depending on the temperature and how long you sit in there it also burns calories (because you sweat like crazy!). The skin is a major organ of detoxification and we release toxins when we sweat. An ND in Owen Sound, Sat Dharam Kaur, also recommends to prevent breast cancer because we can eliminate a good proportion of environmental toxins and hence reduce our risk. Her book 'A Call to Women' is a great resource as a naturopathic guide to preventing breast cancer and includes a chapter on the infrared sauna. Can't wait to sit for an hour and finally have a chance to read my new Elle magazine! A patient recently told me about Ann Gentry, a chef out in California that has blended local and seasonal and vegetarian cooking. I checked out her website and stumbled upon dosha's or Ayurvedic types and what each type should eat. She also has a show on the channel "ONE" called Naturally Delicious. Some of you know that my background is kinesiology. I loved doing my kin degree at McMaster and still to this day use that knowledge with helping my patients achieve their goals, especially weight loss goals. I recently gave a talk at Goodlife Fitness on the effects of exercise on hormones. We covered alot of material and one of the things we talked about briefly was the benefit of intravenous (IV) therapy to boost the benefits of exercise and to provide the nutrients that the body needs before, during and after exercise. One of the benefits of IV therapy is that it delivers nutrients directly into the bloodstream so you get what you need more quickly and efficiently and can take the right doses of supplements without having some of the side effects that might come from taking those supplements orally (e.g. higher doses of magnesium will cause diarrhea if taken orally). This is particularly important in people who have issues with their digestive tract, including Crohn’s, ulcerative colitis, Celiac’s disease, etc. One type of IV solution that’s often used is the Myer’s cocktail. This is a combination of B vitamins, vitamin C, magnesium, and calcium. This cocktail can be great for athletes and non-athletes alike. It’s a great way to support physical stamina and to promote endurance during training. It’s also great for boosting energy in general and providing a source of vitamins and minerals that are readily available to the body. Along with other IV formulas, it’s great for addressing conditions such as chronic fatigue and fibromyalgia. Naturally, another topic that came up at the Goodlife talk was the importance of protein. We all know the importance of protein both for muscle building but also for so many of the processes that take place in the body. Some amino acids, the building blocks of protein, can actually play a very specific role in supporting hormone function. A few amino acids to note are Arginine, which stimulates growth hormone and testosterone, having an effect on muscle building and the management of body fat. Carnitine is another important amino acid; it plays a role in metabolizing fat and providing energy for muscle function. Valine, an amino acid that helps the body use B vitamins and glutamic acid, is also essential in boosting muscle mass. These are just a few examples of how IV therapy can be used to treat some health conditions and to support optimal health. A tailored IV therapy protocol can be a great tool for providing the right combination and amounts of amino acids, vitamins and minerals to support the increased demand imposed by regular exercise and physical training. IV therapy can also be used to correct nutrient deficiencies and in the management of diabetes, heart disease, cancer, and other conditions. For any other information on Claire or IV therapy call or email the clinic today! Last Friday I went to a moms group in Clarkson to chat about some common pediatric concerns and this time brought along Catherine Cabral-Marotta. She is my guest blogger today and she's chatting about one of the concerns she covered on Friday - colic. Here's her take on colic! Osteopathic treatment is a gentle, safe and effective technique for babies and children that utilizes very specific light-pressure techniques to assist that natural desire of the body to remedy mechanical imbalances and return the body to a state of health. For more information, please contact Catherine Cabral-Marotta at the Zawada Health clinic. Exercise as medicine. Love it. Everyone needs to be reminded of how important exercise is. Of course most people recognize the importance of exercise and weight management, and decreasing risk factors for heart disease and diabetes, and most even realize how exercise can alleviate symptoms of depression and fatigue. But what kind of exercise is ideal? Aerobic, anaerobic, weight training, or a combination of everything? Well a new study was presented at the recent American College of Sports Medicine annual meeting that shows resistance or weight training may be ideal. In a study of women suffering with a diagnosis of generalized anxiety disorder, remission of anxiety was 60% in the group that did resistance training in comparison to 40% in the aerobic exercise group. How fantastic! Now I'm curious to see if there are any gender differences and exactly why..... The women perceived the resistance training as more intense than the aerobic exercise so maybe it's the intensity. Regardless this is more proof that everyone needs to get up and move EVERY day. The most common excuse I hear is no time. Everyone can do something for 10 minutes and even if that 10 minutes is some quick skipping or a quick power walk outside or even a little ab workout or just some pushups and situps. Anything works. Just do it! Everyone thinks of celery as a veggie to dip into things. It gets little respect even though it can be a diuretic powerhouse and wonderful at lowering blood pressure..... This salad will definitely change your mind about plain old celery! Last night was a big weeknight for our household! We stayed up past 10 pm! We had a little dinner party to celebrate Chris' graduation from the University of Toronto's EMBA program. We had a great day and then had family over to celebrate. Of course they say you should never try new recipes when entertaining but I rarely follow that rule as I think it's a great opportunity.... especially in this case because it was family. I tried a new tuna tapenade recipe as an appetizer that was delicious (but clearly not detox-friendly with Italian mascarpone as an ingredient!) and a new celery salad. Both were from Ina Garten's cookbook, Back to Basics. 1. At least 1 hour before you plan to serve the salad, whisk together the olive oil, lemon zest, ¼ cup of lemon juice, the shallots, celery seed, celery salt, anchovy paste, 2 tsp salt, and 1 tsp pepper. 2. Mix 1 tbsp of the lemon juice and a pinch of salt to celery before adding enough dressing to moisten well. 3. Cover and refrigerate for at least an hour to allow the celery to crisp and the flavors to develop. 4. When ready to serve, arrange the celery on a platter, shave the Parmesan onto the celery with a vegetable peeler, the sprinkle with walnuts, parsley leaves, salt, and pepper and serve immediately. Quite a few women I see in my practice have some degree of hypothyroidism. Some clinical and some subclinical. Many people have relatives with some kind of thyroid concern or know someone that is struggling with weight that eventually figured out their thyroid was the culprit. Quick primer on what hypothyroidism is: the thyroid gland (sits close to the bottom of your neck below your voice box) doesn't produce enough thyroid hormone in this health concern. The thyroid releases hormones that control metabolism. Symptoms can include: sensitivity to cold, constipation, depression, fatigue, heavier menstrual periods, thin or brittle hair, and weight gain (everyone wants something to blame for those extra pounds!). A simple blood marker called TSH (thyroid stimulating hormone) can be a quick check along with its accompanying markers called T3 and T4. There are varying degrees of thyroid concerns and various causes but for our purposes most people are prescribed a drug called levothyroxine to replace the thyroid hormone the body is lacking. Levothyroxine dose is linked to fracture risk in older adults, according to the results of a case-control study reported online April 28 in the BMJ. The goal of the study was to see the effect of levothyroxine dose on fracture risk in older adults. Using population-based health databases in Ontario, Canada, the investigators identified 213,511 adults 70 years or older who were prescribed levothyroxine between April 1, 2002, and March 31, 2007. Follow-up for fractures of the wrist or forearm, shoulder or upper arm, thoracic spine, lumbar spine and pelvis, hip or femur, or lower leg or ankle, continued until March 31, 2008 (mean duration of follow-up, 3.8 years). Adhering to a very narrow range of TSH on bloodwork is important. Usually the range is from 0.5 to 5 but clinically I find the reference range is more narrow and should be around 2 or 2.5 consistently. This study just verifies how important that small little gland is..... I love how this study was done in Ontario as well! So what can we do naturopathically for hypothyroidism? A tonne!! Of course dietary goitrogens are important to avoid: SOY is a big no-no for someone with thyroid concerns. Minerals like zinc and selenium are key cofactors in making the thyroid work efficiently. A herb called ashwaganda or withania is also fantastic at helping conversion of thyroid hormones. Ashwaganda is also a wonderful adaptogenic herb - a herb that helps your body adapt to stress - and can be used in tincture form or tea form. These are just a few things off the top of my head but important to note is that you don't want to just fool around with your thyroid and start trying things out thinking your TSH may be off. Always important to get that blood test done by either your ND or MD. It's been a busy weekend. Friday I did another Delicious Detox seminar; this time in the newest of the Goodness Me stores. The Waterdown store is a beautiful spot and the 50 or so people that showed up for the talk and cooking demo were fantastic. Saturday I saw patients at the clinic and then crashed at home with Chris where he made a delicious tomato sauce with kale for some brown rice pasta. Today we went out for breakfast at one of our favourite spots in our area - Mitzi's. A cute little spot on Sorauren Avenue in Parkdale where I had some tasty scrambled eggs with fresh dill and sundried tomatoes. Palm Sunday at Church and then this afternoon flew by as we were prepping for my sister's visit. Cleaning, groceries, baking some cosmic cookies from the Planet Organic cookbook..... mmmmmm. And last but not least I was reading this issue of The Pulse and found a colleague's review on my cookbook. So nice to read and hear how people are enjoying the recipes. Thank you Elmira Francinelli, an ND who practises in Woodbridge! Last night we made a quick stir-fry of veggies to go alongside our Crunchy Chicken Nuggets (from Delicious Detox). What started out as a quick mix of fennel, peppers, asparagus, and some olive oil, S+P, and red chili flakes turned out to be a wow mixture with just a fancy little addition of artichokes. This is a great reminder of how your fridge does not need 5 bottles of prepared stir-fry sauces from the grocery store that contain sugar, salt, and preservatives to make a tasty dinner meal. I had a bought a jar of artichokes on the weekend with the intention of making some halibut with an artichoke sauce and decided to throw a few in at the end of the stir-fry. Sometimes I'll do the same thing but with sun-dried tomatoes. Artichokes are definitely a veggie that I would love to use more -- too bad they are so much work to cook! From time to time I'll buy frozen artichokes or a jar of artichokes in olive oil. They are super liver friendly which is key for the Spring. They stimulate bile secretion and are included in many digestive tonics. They are wonderful to help lower cholesterol levels and help support the liver from alcohol damage. The latin name is Cynara Scolymus. Sometimes it's nice to remember that we don't have to take a flight to escape and relax for a weekend. We are so fortunate to have so many great things to see and do in our own backyard. Last weekend was one of those weekends. We booted up to Collingwood for Saturday and Sunday to relax and check out Le Scandinave, a spa in the middle of the woods! If you have come to see me as a patient and you have had a cold or sinus congestion you probably were prescribed cold wet sock treatment, a simple hydrotherapy technique to increase flow and decrease pain. I love hydrotherapy as it really matches my philosophy in how I practise Naturopathic Medicine: back to the basics. So at Le Scandinave after a nice massage, Chris and I trekked outside to the waters. They have 3 hot pools ranging in temperature from 102-104 degrees and then 3 cold 'plunge pools' ranging from 56-58 degrees. So we would sit in a hot pool for 5 minutes then plunge in the cold for a few seconds and then go to one of the 3 relaxation rooms where we would sit for 15- 20 minutes just sitting in silence and reading magazines. There was also a eucalyptus steam bath and a sauna that we rotated through. Everyone was very respectful of the silence and the goal of relaxation. No talking, no blackberrys... it was lovely. Great spot that we'll for sure go back to and enjoy. Chris was giving me grief though because although I was good to do these hydrotherapy baths I wouldn't let us do the traditional banya in Moscow or St. Petersburg 4 years ago when we had the chance. We spent HOURS looking for these damn baths in the confusing streets in Russia and after we finally found them and walked in I chickened out. Maybe the yelling in Russian and the neon signs scared me off. Next time! From 2-3:30 pm I'll be chatting with MYH's 30 day challengers about all the things to keep in mind when keeping a regular yoga practice. We'll be chatting about proper hydration, thermoregulation, nutrition and supplementation, and of course detox! Not only am I chatting about the things I love in the environment I love but in the city I love - Hamilton! Can't wait to drive by McMaster and Cootes Paradise and all my favourite spots!! A few weeks back Global TV's Family Health segment came to Zawada Health. This time is was to do a piece on "superfoods". What are they and are they worth the price tag? It aired last night.... Here's the link! It's the video piece on the side of the screen. When someone hears those words they usually think of Lance Armstrong. Well this week I saw a patient with testicular cancer and I thought that I would blog about some of the basics behind this disease. Exact cause is unknown but there are certain risk factors like abnormal testicle development, undescended testicle, family history, and possibly exposure to certain chemicals and HIV infection. It is most common in male 15 - 35 years of age, and is one of the most treatable cancers. There are two types: seminomas (slow growing and sensitive to radiation) and nonseminomas (fast growing). Symptoms may include but are not limited to: discomfort or pain in the testicle, or a feeling of heaviness in the scrotum, pain in the back or lower abdomen, enlargement of a testicle or a change in the way it feels, excess development of breast tissue (gynecomastia), and lump or swelling in either testicle. Lab tests to confirm may include alpha fetoprotein (AFP), beta HCG and LDH. A CT scan is also done to confirm. The male is being treated by a great group of oncologists in Toronto at Princess Margaret and as a partner in his health care team, I've been asked to help support nutritionally to keep him strong and healthy. *To make the flax egg replacer, combine 1 tablespoon (15 mL) of ground flaxseed with 3 tablespoons (45 mL) of water and let it sit for 2 minutes. 1. Stir the flour, cinnamon, and salt together in a medium mixing bowl. Stir in the blueberries. 2. Combine the milk, water, 1 tablespoon (15 mL) of the sunflower oil, and the vanilla in a small bowl. 3. Stir the flax egg replacer into the milk mixture. 4. Pour the milk mixture into the flour mixture, mixing until just combined, using a whisk if necessary. If the batter is too stiff, add a little more milk. 5. Heat the remaining 1 tablespoon (15 mL) of sunflower oil on a griddle or in a sauté pan over medium-low heat, and then pour 2 tablespoons (30 mL) of the batter onto the griddle or sauté pan, making 4 pancakes. Buckwheat flour browns quickly, so make sure the griddle is not too hot. 6. Once the edges are slightly browned and a few bubbles have formed on top, flip the pancakes over to cook the other side. Had a wonderful but short weekend with my travelling Delicious Detox seminar in Edmonton. I flew in on Saturday morning and was shuttled off to do a 3 hr yoga bootcamp with my sister and a visiting instructor from BC (Karlito!!) at Moksha Yoga Edmonton. Today I did the detox seminar in the morning for a great group of instructors and people that were starting a 30-day challenge. We covered some great information about how to decrease the burden on the body and how to be more conscious about environmental toxins and how they affect us. We can be affected by the water we drink (pesticide run-off), by the food we eat (preservatives, pesticides), by the air we breathe (smog), the clothes we wear, the furniture we sit on (off-gassing), etc. We also chatted about the necessity of sweating as a cooling mechanism and how important it is not to continually wipe the sweat off while in the hot room. In the afternoon I stayed at the studio and did another 3 hr workshop. This one was a posture and alignment clinic that went through each of the postures in the moksha series. It was fantastic as I learned alot of new things even though I've been doing yoga for 8 years. Next detox seminar will be at Flip Dog Yoga in Mississauga on March 19th at 2:30 pm. Male fertility is not the first thing that comes to many people's minds when putting their laptop on their lap, or when thinking about how laptops affect health. Usually eye strain and posture are the health concerns that come to mind with laptops. My friend and colleague, Jennifer Hillier, is an ND at the University of Guelph health center and was recently interviewed for The Ontarion about the topic. Read the article to learn more! I was so surprised to see a little fruit stand at the ACC last night at the Toronto Raptor game. Right beside the bar, between stands of popcorn and pizza, a stand of fresh apples and pears were shining and calling out my name. They also had little containers of cut up fruit and berries. They sold really well because by the end of half-time all the apples were gone! Use it or lose it. Here is a link to my friend and colleague's blog post about a book she recently read (Still Alice) and her tips to keep your brain working well. The book is about a linguistics professor who is diagnosed with Alzheimers at 50 years of age. Shelley and I chat books and movies often and I have always liked her recommendations so this will be the next one on my list! Oh and Shelley if you read this: I don't have a GPS either!! Why is butternut squash so hard to cut and peel? Ugh. Usually Chris (my husband and sous-chef) is in charge of dicing squash but he's still at work and I wanted to get a head-start on dinner. I usually do butternut squash as part of a mixture of root veggies (parsnips, and sweet potato and carrot) and roast them with olive oil and parsley. My mom used to do butternut squash with olive oil and oregano and roast it separately. Oh and she always peeled it; never just cut in half and roasted ... my dad would complain if the squash wasn't peeled (yes my mom is a saint!). Today I've tossed the peeled and diced butternut squash with a few tablespoons of olive oil, a little sea salt and freshly ground pepper, and a tablespoon of minced fresh thyme (I had some leftover from a meal I made on the weekend). I'm going to roast it at 400 degrees for 40 minutes or so until tender. I guess we'll see what herb I like best with squash. So tonight's dinner: cajun catfish, roasted butternut squash, and a fresh kale salad. FYI: Butternut squash is a great source of vitamin A and vitamin C and potassium. Great for glowing skin, and bright eyes among other things! I had a lovely Davids Tea date with a friend this morning. We were chatting about health because her husband got her some kind of new and exciting wellness monitor for her birthday. One topic lead to another and I told her about a study I read yesterday about diet soda being associated with a higher risk of stroke. I also read the same info in the Globe and Mail Life section this morning. The new study presented at a stroke conference in LA this week found a link between diet drinks and cardiovascular disease. Results showed that people who drank at least one diet pop a day had a 48% higher risk of having a heart attack, stroke or fatal cardiac event than those who reported no soda consumption. Am I surprised? Of course not. My two big guidelines when talking to patients are no cold cuts and no artificial sweeteners. I seriously don't get comments around this study saying it's too soon to urge people to shun diet soda. ARE YOU KIDDING ME? Yes water is boring. But is essential for life. Why bother with diet soda? It's a chemical... your body doesn't get it. Have real sugar or honey or maple syrup -- in moderation -- at least your body knows what to do with it. Growing up I never did Sparks or Girl Guides or anything like that. Let's be honest.... I wasn't allowed. Mom and Dad thought what life skills I needed to learn I was going to learn at home on the farm. Ditto for summer camps.... So when I was asked to do a nutrition talk for a group of 4-6 year old girls I was thrilled. The girls were wonderful and we ended the session using my stethoscope so everyone could listen to their hearts! A few weeks ago I was invited to be on a webchat chatting Nutrition 101 on www.fRed.ca, a website for Ontario Liberals. I had a ton of fun frantically typing answers to questions about Naturopathic Medicine, nutrition, cooking healthy for families, and snack ideas from engaging Ontarians. Tonight the fRed website hosted the Premier and I popped on afterwards to see what kind of questions he was answering. My eyes were immediately drawn to the word 'kale'. Larry: Agriculture. Can it be the main economic driver of the future? Hi Larry, it can certainly be a powerful driver. Consumer demand for healthy, local foods is skyrocketing. We can't even begin to meet local demand for organic foods, for example. The agri-food business is one of the top 5 in Ontario. We will always need to eat and there are great opportunities in satisfying our growing desire for healthier and more varied foods. Terri has me eating weird stuff like kale. And I have a feeling more and more families are trying to eat healthier. Way to go Premier! Everyone should be adding dark green leafies into their diet. Great source of calcium and magnesium. Most of my patients know I'm nutso about Davids Tea. My fave right now is Cinnamon Heart Pu'erh. I had never heard of Pu'erh so I did some research. Apparently it is a wonder tea: it aids in digestion (as it is fermented), cleanses the blood and helps with weight loss. Some studies even say it decreases cholesterol. I couldn't nail down how much caffeine it has in comparison to green or white tea though.... If it is similar to oolong in its oxidation it's possible that it is between black and green tea in caffeine content. A great opportunity to learn about Naturopathic Medicine! Find out how a Naturopathic Doctor can help you with health issues such as diabetes, high blood pressure and cholesterol, weight loss, back pain, infertility, flu prevention, etc. Also learn about the many other services available at Zawada Health, a multidisciplinary health clinic in the heart of Mississauga. A great way to meet and chat with the practitioners of Zawada Health, including our newest Naturopathic Doctor at the clinic, Claire Girgis, ND. Drop in any time between 11 and 3, bring your family and friends and all of your questions! Draws for Delicious Detox and Unlimited Monthly Sauna Packages! I'm forever trying new granola recipes. I used to make my own granola when I lived on my own but got off track somewhere along the way. This weekend I tried another new concotion but tried to keep it simple with all the additions. Turned out to be great! Not too sweet - which was my focus this time. I wanted to see what was the least amount of 'sweetness' that I could add to my usual amount of dried ingredients without sacrificing fun factor (as my sister would say!). My base is usually 4 cups of grain. This time it was a bit of a smorgasboard as I had a little of everything in my cupboards. I mixed all of this together and then in a separate bowl I mixed 1/2 cup coconut oil and 1/3 cup maple syrup and 1 tsp pure vanilla extract. Mixed everything together and spread it all on one baking sheet. I put it in a preheated oven of 350 and baked it for 40 minutes stirring around a few times. I let it cool for a couple of hours before storing. Simple and so quick and I'm sure a lot cheaper than buying granola and for sure less sugar! Love these Sunday mornings when I can relax a little and take my time with the papers. This morning Chris and I went out for breakfast and decided to buy the NY Sunday Times to peruse through while eating. There was an article that caught my attention in the front section (not the SundayStyles section as usual!) for 2 reasons. One because it was about Memorial Sloan-Kettering Cancer Center and one of my good friends works there as a plastic surgeon, and two because it was about an executive chef that works there that caters to the needs of young patients. "Goodbye, neon Jell-O and watery broth!" From my perspective healthy eating is a necessity all the time but especially in times of sickness and disease. It never made sense to me that patients in hospitals were being fed garbage. Nothing nutritious to actually give them strength and support. Even though a long time ago, I still remember my grandma and great-aunts and uncles in hospitals and seeing mashed potatoes and gravy and Jell-O. What the....???? The article says that Sloan-Kettering patients can actually order meals from one of 75 room-service menus - kosher, halal, vegan, low-sodium, etc. One of the pediatric oncologists even noted that eating well can speed recovery and keep patients off intravenous nutrition. Cancers and chemotherapy can often result in mouth sores, nausea and vomiting and difficulty swallowing. Having certain dietary restrictions is also pretty normal in these situations. The chef will meet with pediatric patients and their parents to discuss food preferences. How wonderful to be able to make a child with cancer happy because the hospital could provide a meal that was not only suitable nutritionally but also something like his/her mom would make at home.